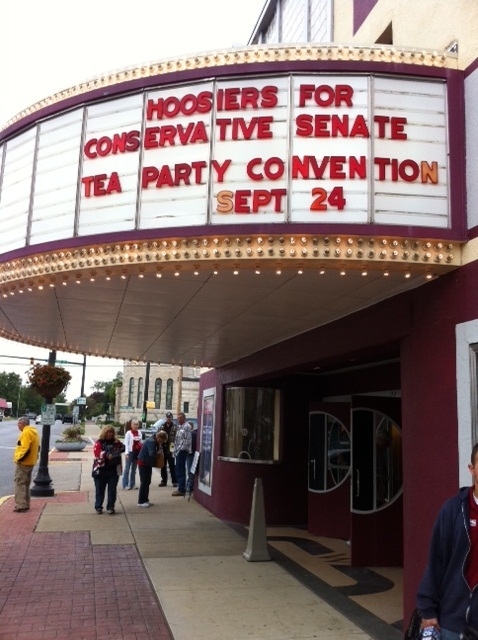 On September 24, FreedomWorks joined Hoosiers for a Conservative Senate and over 300 activists from local groups across Indiana for a Tea Party Convention in Greenfield to decide which candidate they would support in the 2012 U.S. Senate race. “The movement believes strongly in a bottom-up rather than top-down approach, and this convention -- which gives each attending group two delegates to cast votes in a straw poll -- allows for that,” Monica Boyer, a Kosciusko County tea party activist told the Indianapolis Star. The convention was composed of both attendees, who cheered from the gallery, and delegates who waved placards denoting their respective congressional districts. After speeches from local leaders, delegates cast their votes in a straw poll for either incumbent Senator Richard Lugar or State Treasurer Richard Mourdock. As the delegates came on stage to vote, their district placards were combined to form an American flag. In a decisive victory and an affirmation of his grassroots support, Richard Mourdock received 96 of the 97 votes cast by the delegates. 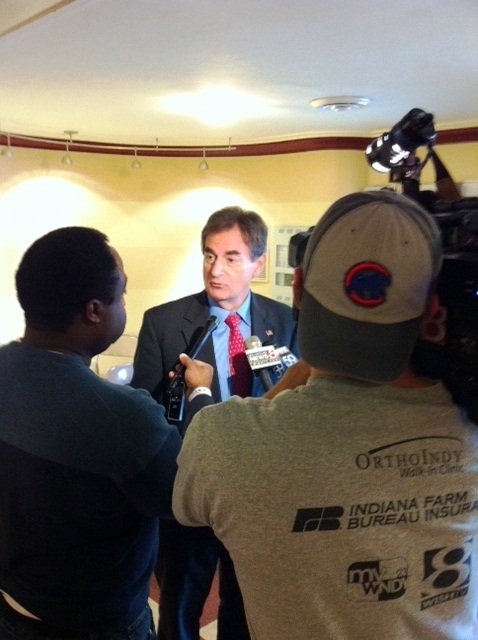 After the vote, Mourdock spoke to the convention about the passion of the activists and compared their resolve to that of our Founders. “If five people in the backroom of a bar can change the history of the world, what can come from this meeting?” Mourdock said, recalling that the American Revolution was planned by a small group of patriots in a Boston tavern. The rebuke of Sen. Lugar by the activists was seen as inevitable given his long record of opposing conservative principles. "The nation has a problem with not only a budget deficit, a severe one, but also a massive debt problem. He's been there for 36 years, but he hasn't done much to combat that, so it's time for somebody else," said Greg Fettig, co-chair of the Hoosiers for a Conservative Senate. FreedomWorks President Matt Kibbe, Vice President of Communications Adam Brandon and I addressed the convention, encouraging local activists to stay organized on the ground and in the media. "We told the crowd, 'This isn't the end — it's the beginning. Everybody go out and buy a new pair of shoes because we are going to pound the turf and go door to door, make phone calls and everything else,'" Fettig told the Associated Press. I'm a native Hoosier; but, have been gone a long, long time. I'm proud that the Tea Party members gave a ringing rebuke to RINO Lugar and endorsed a true Conservative in Richard Mourdock. It wouldn't surprise me at all if Lugar would switch and run as a Democrat - after all, that's the way he votes most of the time. I'm also affiliated with the Tea Party movement - 1st Brigade, Tea Party Patriots. We need to keep the momentum going and prove that the 2010 elections were just a preview of what's to come in 2012! A clean sweep with a very large broom! It was a great day, but you haven't seen anything yet. Just wait for the headlines the morning of May 9th. I say, "Go Mourdock!" GO! As the economy begins to take off as a result of the Tax Cuts and Jobs Act, the next big thing we're going to see is a need for workers. Around the country, Universal Pre-K has been an issue that has been getting a lot of discussion. During the 2016 election, Indiana gubernatorial candidates Democrat John Gregg and Republican Eric Holcomb promised to expand and increase funding to the state’s On My Way Pre-K pilot program, which was implemented to expand low income family access to Pre-K education. Since having become Governor, Eric Holcomb has made expanding this program a priority in his goals for the state budget and has even suggested doubling spending on the program. One of President Barack Obama's most controversial regulations is getting a lot of attention after President-elect Donald Trump nominated Oklahoma Attorney General Scott Pruitt to serve as administrator of the Environmental Protection Agency (EPA). The Clean Power Plan (CPP), under the purported authority of the Clean Air Act, requires states to develop plans to reduce emissions by 32 percent below 2005 levels. If a state fails to adopt a plan, the EPA creates one for it. The rule will supposedly avert 0.015°F by 2100 of future temperature increases. In these cold, winter months, road maintenance naturally becomes a commonly-discussed issue. Indiana’s state legislature has made road infrastructure repair a top priority. However, several Republicans in the state House have other plans, with consequences lasting long after the ice has melted and the pot holes have been filled. Common Core Roundup: What are States Doing for Education Freedom? It’s a new year, and the state legislatures have come roaring back into session chock full of ideas to stop the Common Core education standards that are damaging school systems all across the country. Last year, we saw Missouri, Oklahoma, and South Carolina withdraw from the standards, and 2015 looks to be off to a good start. Progressives and establishment Republicans look out! Adam Brandon was on NPR to analyze the primary runoff results in Mississippi. The Diane Rehm Show hosted a panel to breakdown the results. The GOP establishment just set a new low by mimicking race card antics of left-wing activists like Al Sharpton in a desperate attempt to have Senator Thad Cochran defeat challenger Chris McDaniel in today’s Mississippi primary. Senate Minority Leader Mitch McConnell has a bone to pick with the tea party. Speaking in an interview not too long ago, he groused that conservatives under the tea party label are ruining the Republican brand and that their continued influence poses unacceptable risks to the upcoming elections in 2014. Happy Birthday to the little movement that could. Ignited by a spark from the most unlikely of places-a cable business news channel watched mostly by investors-and spread by social media, a surprising revolution had its most humble beginnings five years ago today.